Appalachian Voices is seeking an energetic, creative person with previous media and communications experience, ideally with an advocacy-oriented mission, to intern with our communications team in our Charlottesville, Va., office. The internship will be tailored as much as possible to the person’s interests and skill set. The person will work closely with our Communications Director. Start and end dates for the internship are negotiable. Hours will average 10-15 a week and can be flexible, although a fairly consistent schedule is optimal. The intern may do some of the work remotely, but should plan to work in our office at least some of the time to better understand our work and to gain more in-office experience. The internship is unpaid, however the intern will be reimbursed for potential travel and events for specific assignments. 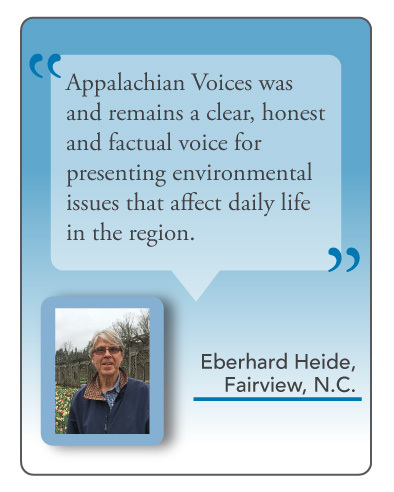 Attending Appalachian Voices-sponsored, or other events, capturing content on camera or video, posting on social media and otherwise assisting program staff at the event. Graphic skills, including photography and video, are a plus. To apply, please fill out the Intern Application form (link below) and send a resume, three writing samples and a graphic or image-oriented sample if you have one to: Cat McCue, Communications Director, cat@appvoices.org.